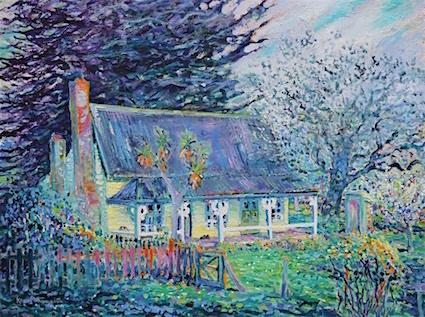 I worked on this painting of my favourite little cottage, bit by bit, over two years. Built in the 1870s it belonged for many years to Mr and Mrs Perry who, from the 1920s until the 1970s presented moving picture shows in local halls all around Tasmania. Mrs Perry would look after the ticket booth and then, in the early days, would slip over to the piano and provide accompaniment while her husband ran the projector.